Personally I love the queue for the loo. 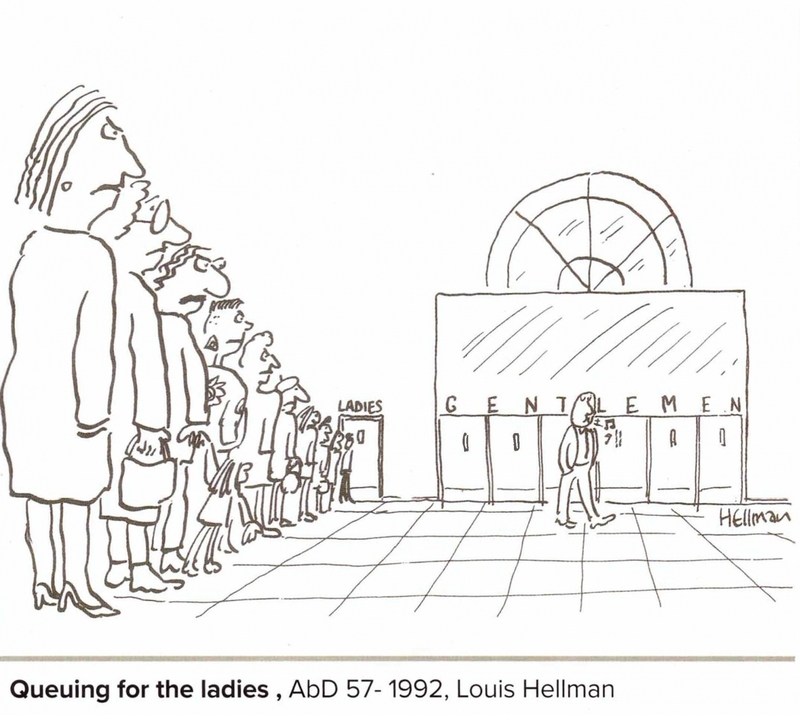 As a researcher in publicly accessible toilets (toilets available for the public to use in the public and private sectors) – the queue is where I often get the opportunity to add to my research. My fellow queuers often talk about the fact that we are in line again, or comment on the state of the facility and there never being enough cubicles. If they see an older person, or someone using a mobility aid or a parent with a desperate child they sometimes let them go ahead of them – sometimes in some toilets there is a sense of solidarity in our poverty of provision. I have also been standing in the toilet queue when it stretches past the accessible toilet and heard my fellow queuers comment that no-one is using this cubicle and how ridiculous this is when they are having to queue. Sometimes one (or two together) will leave the line and dive in – coming out to find most of us still waiting. In my many years of researching public toilets I’ve never seen a queue for the accessible loo. The accessible toilet can be seen as emblematic of access – but can it be considered inclusive or does it just continue a special needs approach to the design of our built environment – the equivalent of the poorly constructed ramp added onto the building. As a symbol of inclusion and taking impetus from the social model of disability, the accessible toilet has attempted to meet the needs of potential users. Yet its design has focused on the limitations of the potential users body and as such can be argued to be based on the medical model of disability abhorred by activists. Is the accessible toilet therefore a special needs solution, not a symbol of inclusion but a continuation of exclusion? This paradox of inclusion is further illustrated when accessible provision is separated from the standard and presumed able toilets, dividing provision by ability. 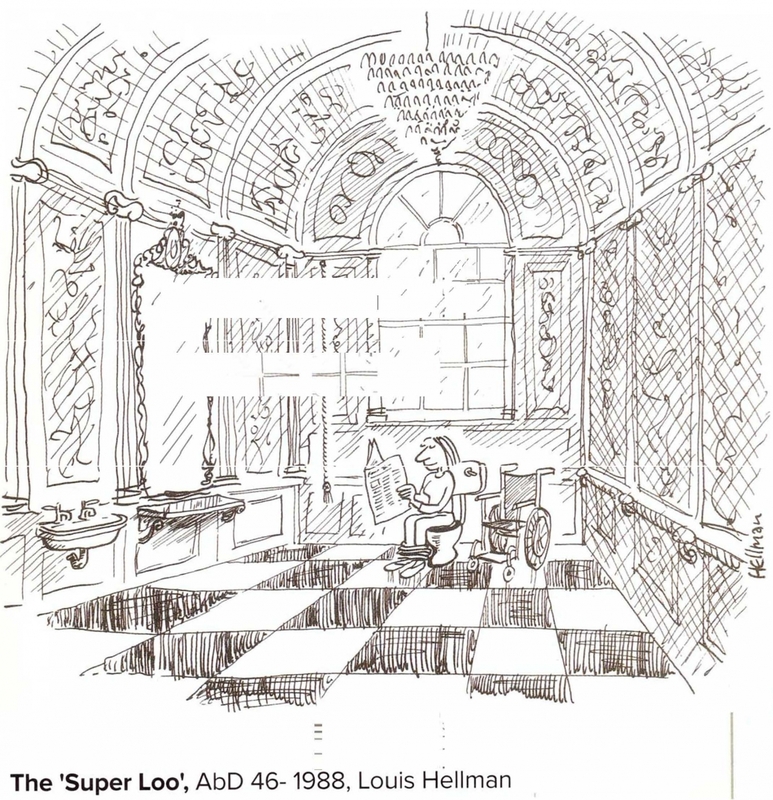 In the history of UK public toilet provision, it was men who were first catered for, with provision for women an afterthought in the design of the city (Penner, 2001). Similarly to the design and implementation of the accessible toilets, toilets for women follow a ‘special needs’ solution in built environment design. This is most often demonstrated through the failure to provide adequate infrastructure for sanitary disposal, the required sanitary bin the ‘add on’ and afterthought in the design (Ramster et al, 2018). The cultural life of the publicly accessible toilet means that it carries with it potentials for activities not associated with its primary excretory function. In many accessible toilets, locks have been installed with keys only available to users deemed legitimate, and in some facilities blue lights are installed to prevent intravenous drug use. Such interventions present an interesting question for inclusion, if an environment is to be inclusive and socially equitable should it not also tolerate practices that might upset our perceptions of civilised behaviour and decency? Or do we design inclusion to exclude those whose behaviours and/or needs we don’t sanction. Could the continued focus on designing out such behaviour encourage such activity in the thrill of transgression? 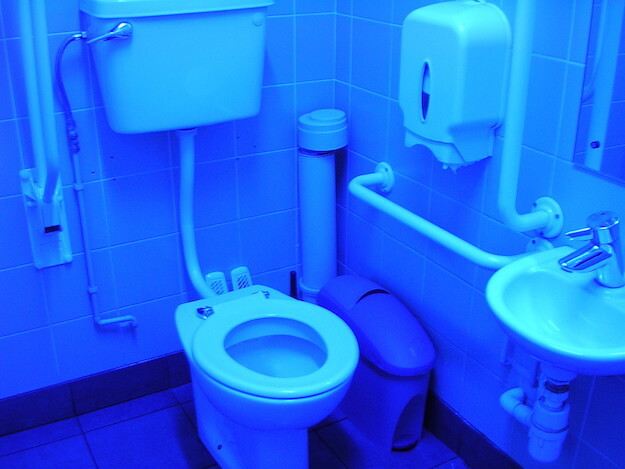 Photograph 1: A blue light toilet prevents intravenous drug users from finding veins. 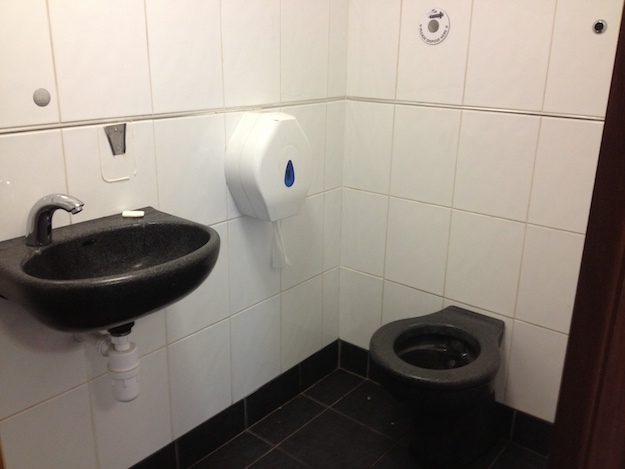 Its use in an accessible toilet can be problematic for many users. Photograph 2: This toilet provided a sharps bin and was gender neutral. It has subsequently been closed. Inclusive design for social equity presents many challenges, but also a wealth of opportunities to reframe how many people might gain wider access to the built environment. Our cities require movement between spaces and at some point the need to use the loo will have to be catered for. With austerity cuts in welfare support hitting the disabled community especially hard, the city and its opportunities for employment to ease the cost of welfare needs to be accessible for disabled people, and the cornerstone of this access for inclusion is the provision of toilets that meet the requirements of all potential users. Publicly accessible toilets are therefore crucial for inclusive design towards social equity. But we have to have open and honest discussions about who has legitimate access to these spaces. Will this access be based on gender and/or ability? Currently toilets are hotly contested spaces which encapsulate issues of ownership and entitlement. For the accessible toilet, the current design template and placement can be considered a continuation of a special needs response in design. Whilst symbolic of access, it is emblematic of the failure of wider inclusive and socially equitable design. In short, if we are to design inclusively for social equity – who do we leave out? Penner, B. (2001) A world of unmentionable suffering. Women’s public conveniences in Victorian London. Journal of Design History 14 (1) pp. 35-52. Ramster, G., Greed, C & Bichard, J. (2018) How Inclusion can Exclude: The case of public toilet provision for women. Built Environment 44 (1) pp.52-76.